Pallab Roy has been passionate about cars since childhood. He drove the Ford Zephyr when he was only 10 years old. As he grew up, his passion shifted to vintage cars, and then moved on to restoring them. His first major car restoration was on a 1967 Mercedes 230S. 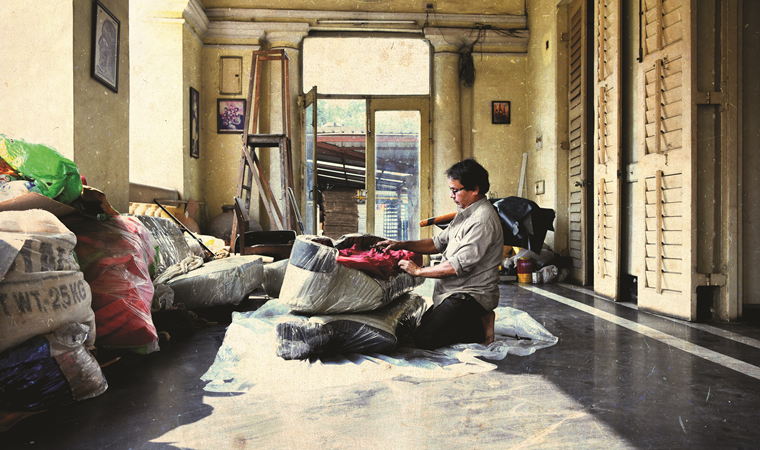 His son Saurav is equally passionate about restoration and is currently under his father’s tutelage. The young man now does the difficult paint job on his own. The father-son duo has become immensely popular and respected for restoring a number of vintage cars, including the 1928 Studebaker President (8) State Limousine, 1947 Chevrolet Fleetmaster Sport Sedan, 1947 Wolseley, 1947 Pontiac, 1951 Mercury Sports Sedan and German-made 1937 Wanderer W24, famous for Netaji Subhash Chandra’s great escape in 1941, to their original glory. Cars come in for restoration in real bad shape—in most cases, with severely damaged body, missing fitment, no colour and original brochure reference. Generally, the duo first does research, arranges photos for reference and brochure, and then lays out a detailed plan before starting the restoration work. The process starts with rebuilding the metal frame of the body shell, rolling chassis and engine. In most cases, this takes a long time, as they reconstruct corroded metal parts. In the first photo, we can see a worker cutting and replacing the entire metal roof, which looks beyond use. The ‘8’ on the logo refers to the eight cylinders, while ‘State’ denotes certain fitments, like four wire wheels, two spare wheels, and luggage carrier. In the old days, the seats were sometimes made by hand-stitched broadcloth, mohair, leather, etc., along with some ornamentation. In most cases, it is the entire seating area along with seat frames the upholstery team has to reconstruct. At the same time, a separate team works on the chassis, carpentry, ornamentation and the jewellery. Once the metal frame and roof are fixed, the painting process starts, followed by a lacquer finish. There are technicians who specialise in glass, fitment channel and locksmith work. Fixing the windscreen is sometimes very difficult as the right glass is not easily available. The intricate ornamentation, badges, and logos are done by Somnath Dutta, a local jeweller and ornament artisan who is connected with the Raj family for three generations. 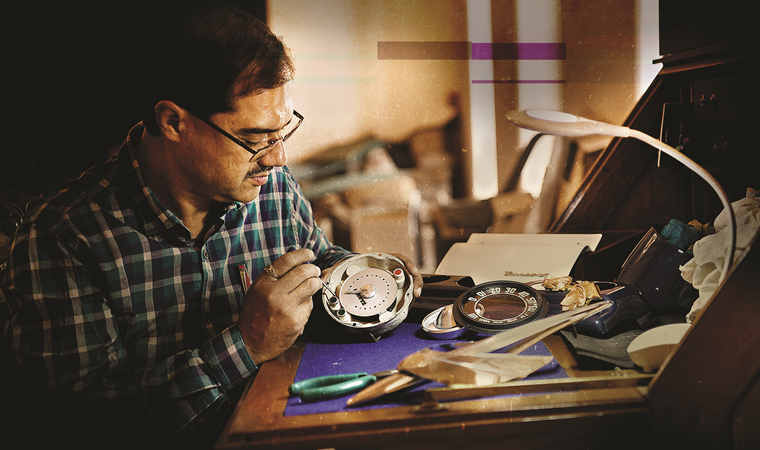 Pallab Roy generally does the restoration of the dashboard, speedometer and other small parts himself. Even after restoration, regular maintenance is required for these vintage cars. 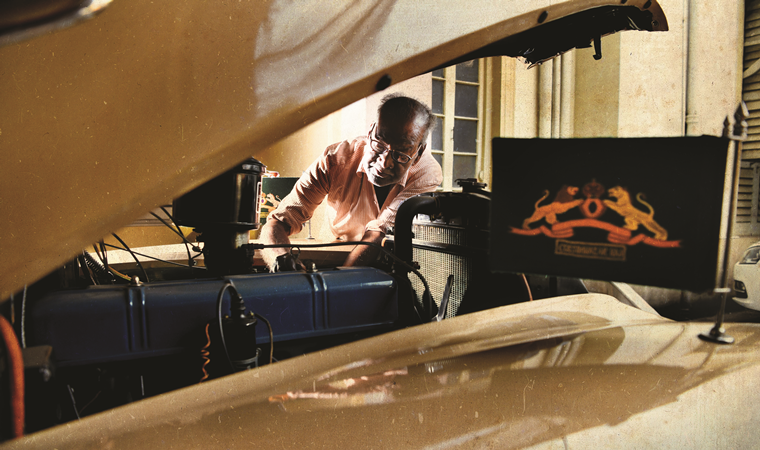 Pallab Roy and his family own six vintage cars, which he drives regularly to keep the engine running—which is again a huge task. 3. Engine part ready to be fitted; 4. 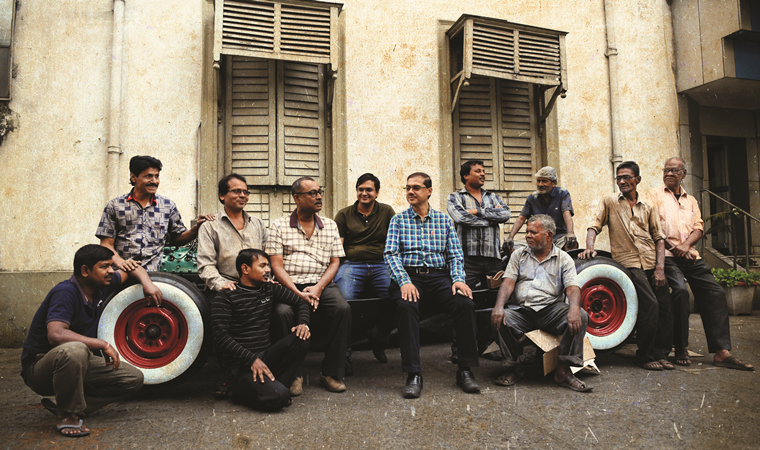 The team: Pallab Roy (blue chequered shirt, sixth from left) with his son Saurav (earthy tone T-shirt and blue denim, behind his father, seventh from left); 5. Pallab working on the speedometer of a 1951 Mercury Sports Sedan; 6. A typical jeweller studio. The mascot or logo of the famous 1937 Wanderer W24 car is visible. Once the metal frame and roof are fixed, the painting process starts, followed by a lacquer finish. THE 1928 Studebaker President (8) State Limousine, manufactured in 1928 by the Studebaker Corporation. At the time, the Studebaker Corporation was already 74 years old and famous for horse-drawn carriages, wagons, fire tenders, etc. It was famous on many counts. Firstly, it had eight-cylinder engines developed by Studebaker in 1928. The driver and passenger compartments were connected with an electrically operated intercom, invented by the US-based Dictograph Corporation which was also used for the first time. At the same time, a separate team works on the chassis, carpentry, ornamentation and the jewellery. The ‘8’ on the logo refers to the eight cylinders, while ‘State’ denotes certain fitments, like four wire wheels, two spare wheels, and luggage carrier. The first compartment for driver and co-driver is done in leather, the five-seater passenger compartment is done up in real mohair and broadcloth upholstery. Though there were many saloon body models manufactured, limousines were rare as they were the top-of-the-line product. 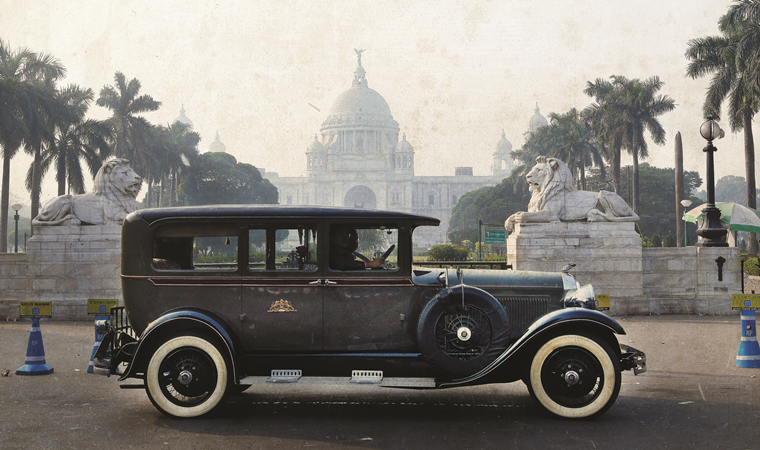 In 1928, two Studebaker Presidents were sent to India—one for sale, and another, a right-hand drive model for display, which was eventually bought by the Cossimbazar Raj family. This is perhaps the only existing Studebaker President (8) State Limousine in the world. The mascot or hood ornament also has an interesting story which refers to the mythological character, Atalanta—the female version of Tarzan. Studebaker commissioned the famous sculptor Carl Moss to develop and design the figurine of Atalanta who is riding the ocean waves and leaping towards the sky, with water flowing down her body. 3. Cossimbazar Raj family’s house. 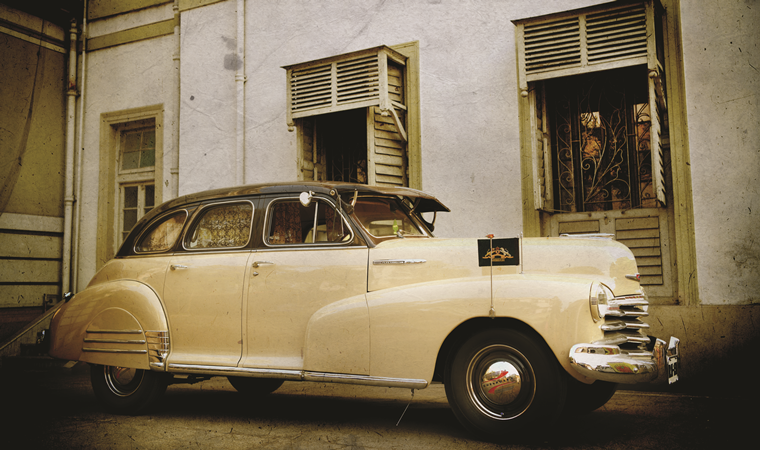 The 1947 Chevrolet Fleetmaster Sport Sedan, which originally belonged to the Bikaner Raj, stands proudly in the front.